The day leaving Lumbini began our second major travel day after leaving Pokhara, and was one met with a few nerves and raw excitement. As luck would have it we managed to wrangle our way straight onto a local bus headed toward the Nepali border town. The 24 seat bus was rammed tight with close to double the number of people standing, us included. After the first stop the ticket master/boy then ushered us up to sit on a bench behind the driver. During the one hour long drive Natalie’s shoulder was used as a handrail, a handbag storage and at various times an emergency braking device, while for most of the journey my knee was hyper flexed in the wrong direction. After the arduous bus ride the day before this was now stock standard and what we expected. 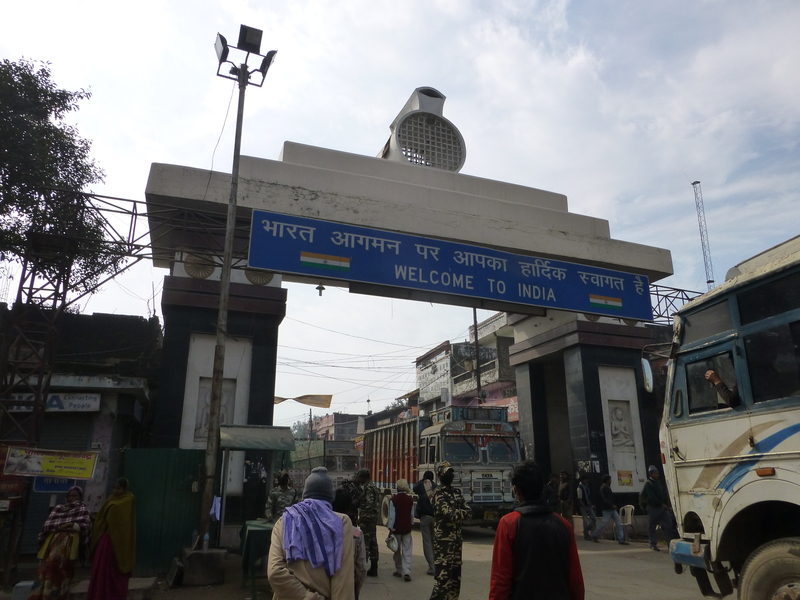 Arriving at the border town we then negotiated a taxi for the 4 kilometre drive to the border itself. A straight line drive, it appeared our driver had to stop for directions on at least two occasions! Border formalities were relatively straight forward and the Nepali immigration officers would have to go down as some of the friendliest we have encountered (UK and Australian Immigration please take note!). There is something quite rewarding about walking across National frontiers, what with passport checks, military questioning and the general shadiness of about every border town we have ever visited. Our arrival into India was met with the customary assault of touts all promising safe passage to onward destinations. With no buses to our hopeful first port of call (Varanasi) we had agreed to take a share jeep to the transport hub of Gorakhpur. What the tout lacked in sales skills he made up for in sheer persistence and determination, so we piled into a small jeep with a Korean, three locals and a family of seven! Combined with our three drivers/rooftop luggage securerers our ramshackle caravan began the two hour “express” dash to Gorakhpur. I say “express” because buses are supposed to take a minimum of three hours. Our driver had obviously been taught by the mysterious hooded driver of the previous day, or thought he was the future Indian Sebastian Vettel as we careered down in record time. There were some very near misses, several games of chicken with oncoming traffic, wheel screeching and a couple of moments where my heart skipped a beat or two! All part and parcel of your average journey in India! 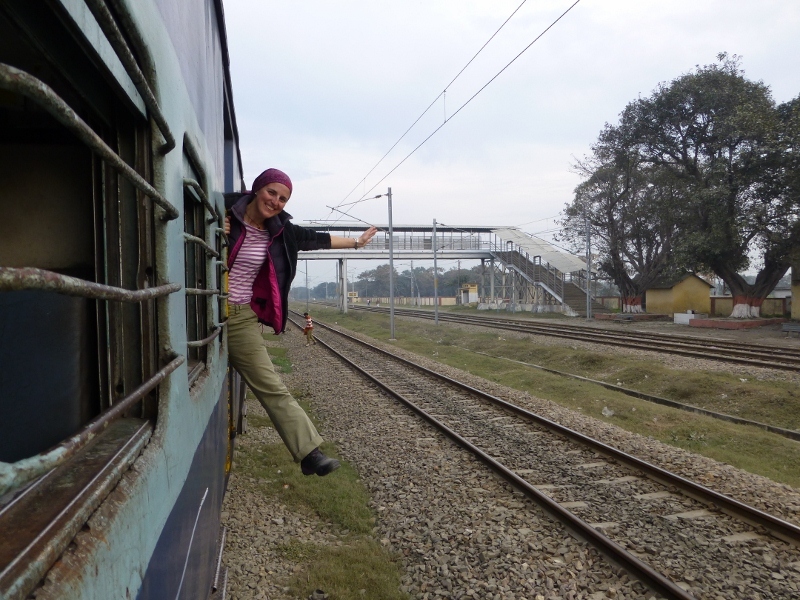 Arriving into Gorakhpur train station the adventure really began as we tried to organise a train ticket to Varanasi. The station was a seething mass of people, cows and dogs and we made straight for the shortest queue. I waited, pushed and shoved like a local while Natalie followed a sign to Tourist Services (which was closed). Upon arrival back to line Natalie found me being lambasted for pushing my way through the ladies queue! Luckily we swapped spots and within minutes we had an unreserved ticket to Varanasi, a five hour train journey, or so we thought. The ticket seller told us the next train left at 4pm – perfect. When Natalie asked what time it arrived she shrugged her shoulders and said “about 9pm”. How wrong she was! 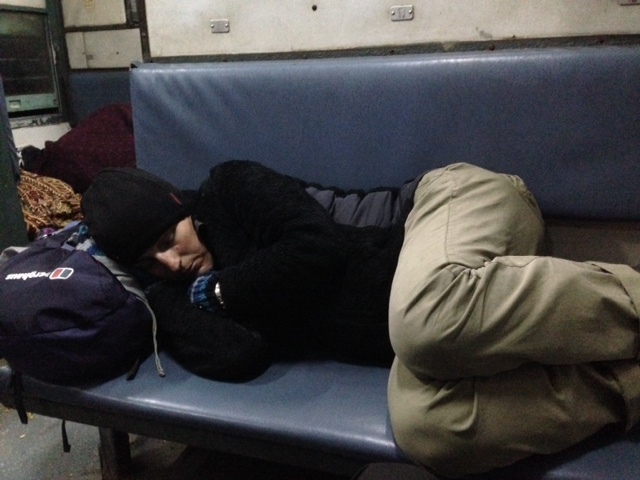 Tired, hungry and edgy after a couple of big and rough travel days we struggled to find our train (we later found out we had no specific train booked just an ‘open ticket’) but it was a great lesson in Indian train travel! Finally we boarded a near empty train that was apparently bound for Varanasi. The carriage was allegedly constructed in 2010 but looked like one of the first trains ever put into circulation. So our train rumbled out the station carrying us, and an assortment of cockroaches and rodents (yes rodents!) for our first Indian train ride. Natalie was fascinated by the open doors throughout the journey and for the first dozen stations insisted on ‘swinging’ out the door! Who needs to shut the door? 9:00pm came and went with no sign of Varanasi. At around 10:30pm we were starting to wonder if we had boarded the wrong train until my desperate scramble around the platform at one stop unearthed our alleged arrival time of 1:00am! Both of us by this point were struggling to keep awake. Natalie ‘trying’ to stay awake!! Cold, hungry and totally exhausted we arrived at Varanasi around 1:36am, grabbed an auto rickshaw and then drove around to find a guesthouse. At about 2:30am we finally turned the lights out and crashed out to sleep. What a day and proof this certainly isn’t your all inclusive package holiday!